The Initiator Starter Set is the perfect introduction to the thunderous experience of E, F, and G powered rockets. This comprehensive set of kits includes the over 3 foot tall Initiator rocket, Mantis launch pad, Interlock 12 volt launch controller, and complete illustrated assembly instructions. Reload Kits and Single-use motors are sold separately. 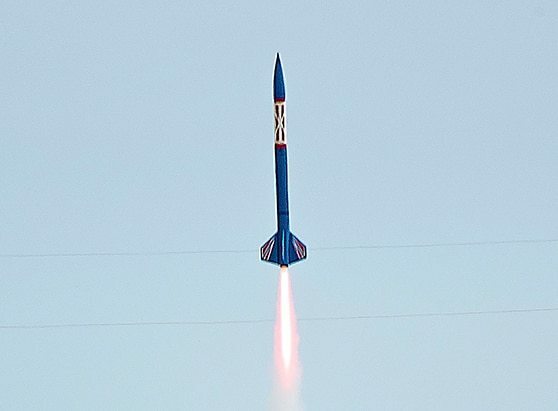 The Initiator is Aerotech's signature rocket kit. Are you itching to fly F and G motors? The Initiator is simply the best big rocket to build first. It features molded fins, beautiful color coordinated decals, and a no-wadding ejection system. An impressive 3 feet tall, the Initiator is one gorgeous rocket. Tools, construction, and finishing supplies sold separately. In order to launch, a launch system, model rocket motors, igniters and are also required. May ship USPS Parcel Post or UPS Ground. No HAZMAT shipping required.